A persuasive speech has to be able to inspire the listeners. Therefore, it is very important that the speech is coherent, relevant and extremely articulate. If you are not sure how to go about it, the persuasive speech examples will come extremely handy. The Speech Templates will make sure that you talk in a manner that would keep your audience at the edge of their seats and totally convinced and persuaded when you are done with them. The templates can be downloaded online free of cost. They are highly compatible with most software so you do not have to worry about running the. Also, you can have them customized as well. 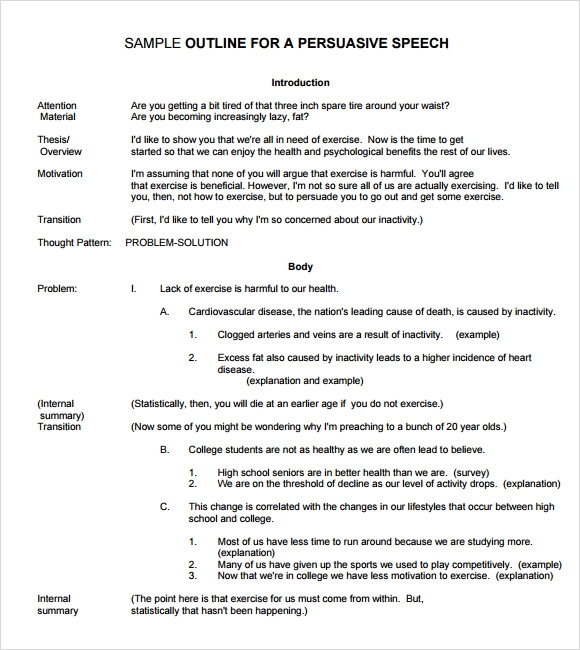 This is a useful template dedicated to help you write a persuasive speech, whether in written or spoken format. It guides you through the elements that you have to incorporate in your speech, along with other factors that you have to keep in mind. Use this template to write a convincing speech on any given topic. This is a complete format which you can use to write a persuasive speech to entice your audience. While using the given elements of appeal, you can convince your audience and take them with you like a storm. A persuasive speech is very important for influencing people and letting them sway with you. 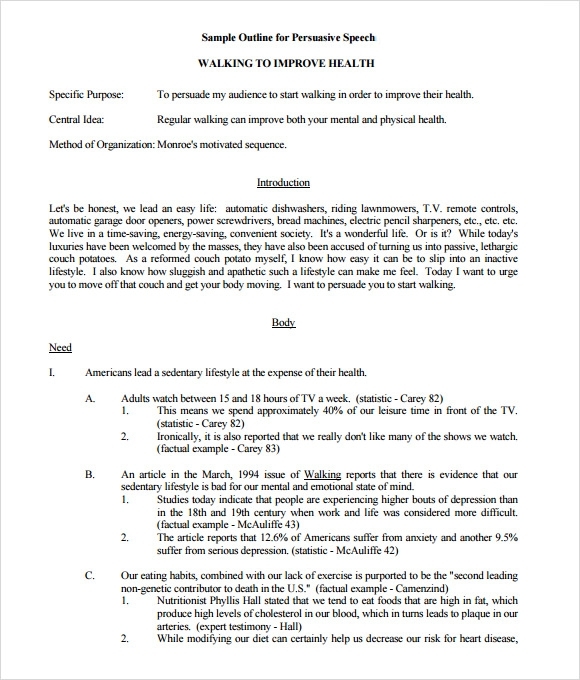 This is a sample speech that talks about the importance of walking for the benefit of health. By studying this format, you can understand the different sections that a speech should include, what to talk about in each section, and how to make it more attractive and enticing. 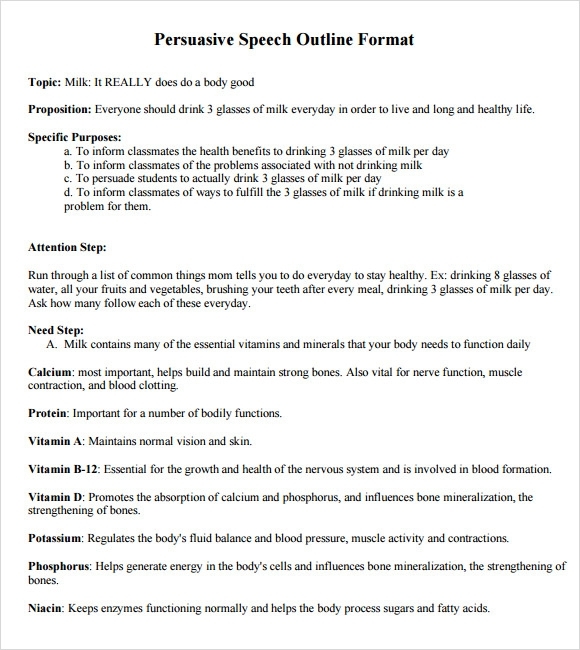 This sample speech is a detailed persuasive speech template that describes about how to write each and every line of the speech, including its introduction, body, conclusion and other sections. It clearly defines what you should write in the first line and second line of the speech’s introduction, along with all other parts of the speech. 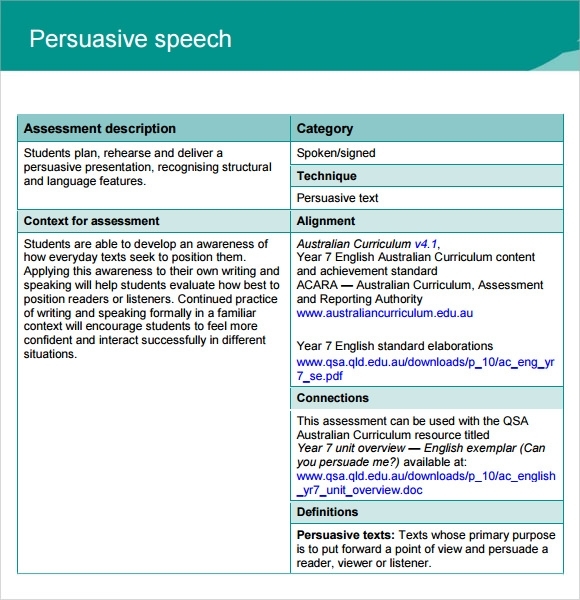 Why Do You Need a Persuasive Speech Example? Persuasion is a form of art. It serves as an effective tool to impress your audience and make an impression on their minds. When you give a speech in front of public, merely giving them information is not enough. You have to convince them about what you are saying, and persuade them to agree with you. 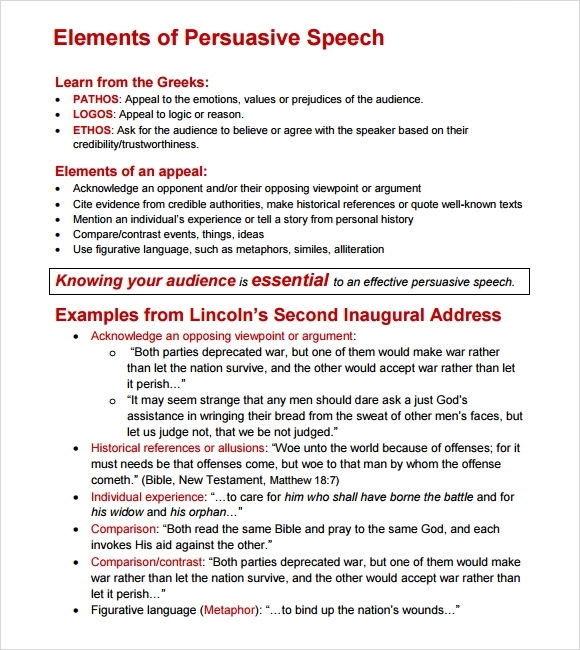 When you study a persuasive speech sample, you can know what elements to include in your speech, what your speech is lacking, and how to make it more interesting for your audience. You may like Graduation Speech Templates. 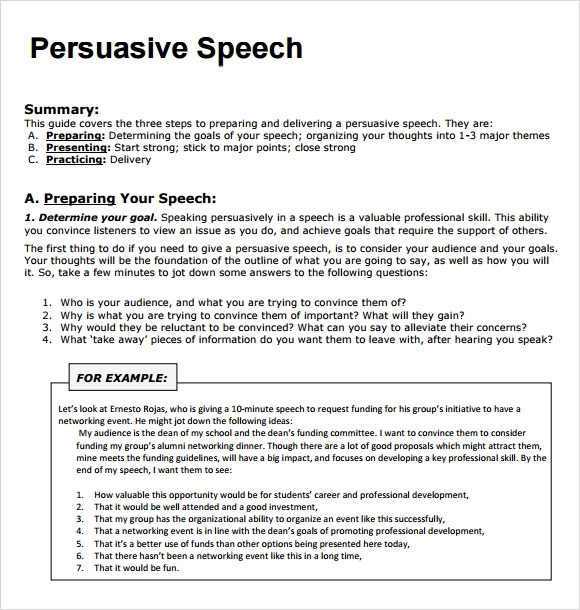 When Do You Need a Persuasive Speech Example? If you are a businessman, it is very important for you to give a persuasive speech and convince your audience to use your product or service. If you are involved in a debate, legal proceeding or a marketing campaign, it is important to deliver a persuasive speech so that your audience can feel convinced and won over. With elements like credibility, authenticity, emotional appeal and others, you can make your speech more persuasive and convincing for your audience. You can also see Commemorative Speech Templates. A persuasive speech example is very important to study before writing a speech, as it helps you to know how to create a speech that can leave a long lasting impact on your audience. These example speeches are easy to download and customize as per your requirements. They have been designed by experienced professionals, due to which they include all the elements that are needed to create a persuasive speech. If you are a businessman, legal professional or involved in any other profession in which speech is very important, these persuasive speech examples will help you create a best convincing speech for your purpose.